Sergio Marchionne on a partnership between FCA and GM: "You may reject the deal but you can't reject the discussion." JASON STEIN: Marchionne waits at the gate, but who is there to answer? DETROIT -- General Motors has flatly rejected the advances of its crosstown rival, Fiat Chrysler Automobiles, but FCA CEO Sergio Marchionne is not going away -- not by a long shot. Marchionne says he has sweated the details and done the math and discovered there's far too much upside in a merger of FCA and GM to let a deal go undone, or at least unexplored. In a blunt, two-hour interview in his downtown Detroit office, Marchionne said the numbers come out so good that his board of directors has no choice but to put pressure on GM to begin discussions now. "It would be unconscionable not to force a partner," he said. That sounds like a hostile takeover bid is in the works. "Not hostile," said the FCA chief. "There are varying degrees of hugs. I can hug you nicely, I can hug you tightly, I can hug you like a bear, I can really hug you. Everything starts with physical contact. Then it can degrade, but it starts with physical contact." GM insiders, speaking on background, question Marchionne's assertions about synergies and suggest a merger with FCA is a bad idea all around. 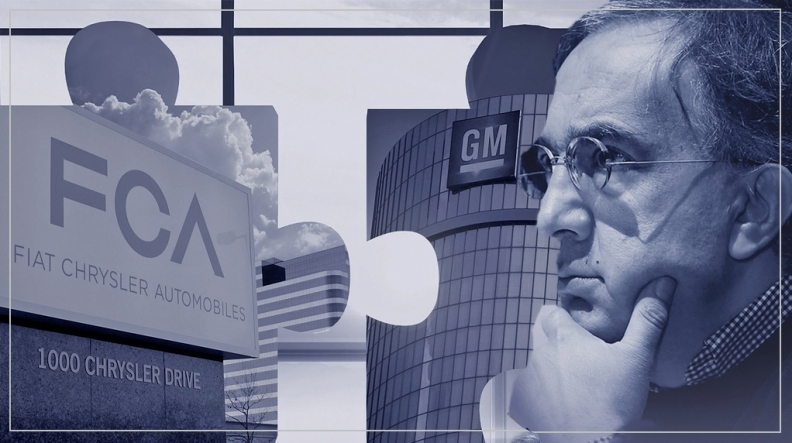 "Why," asked a high-ranking GM executive, "should [GM] bail out FCA?" But Marchionne says the logic of the deal is "irrefutable." "We're not talking about marginal improvement in margins," he said, "we're talking about cataclysmic changes in performance, just huge." He said: "I've gone through product by product, plant by plant, area by area, and I've analyzed them all. "I've obviously made some arbitrary assumptions about which architectures survive, which engines survive, and the only deal that offers them the same benefits as we potentially get ... is us." The potential profits, he says, are exponentially larger than the current combined global earnings of GM and FCA. Marchionne says GM isn't taking his phone calls. "I've offered to sit down with them and take them through the numbers," said the Italian-Canadian CEO as he sipped an espresso and swiped through documents on his tablet, giving his visitors a cursory look at various charts and graphs he says make his case. "They won't listen. And that kind of abject refusal to engage ... the capital markets won't understand why you are rejecting the discussion. "You may reject the deal but you can't reject the discussion. If you're refusing to talk to me, and you have seen nothing, you either think you're above it all, or you think the capital markets are full of schmucks that owe you something." Marchionne says he doesn't lack for potential partners and he could sell or merge FCA as it stands today. "There have been responses of people who have shown interest in discussing," he said. "Are they the people I wanted to get the response from? The answer is probably not. There are people who are interested in doing deals. I'm not interested in doing deals with them ... because there's a better deal. Without specifying how he arrived at the figures, Marchionne cites a staggering combined EBITDA (earnings before interest, taxes, depreciation and amortization) figure that he says would result from the merger of FCA and GM. "Look, the combined entity can make $30 billion a year in cash. Thirty. Just think about that [expletive] number," he said. "In steady-state environments, it'll make me $28 to $30 billion," at a seasonally adjusted annual selling rate of 17 million. Arndt Ellinghorst, head of global automotive research at Evercore ISI, says the target is realistic. "A combined GM-FCA will generate almost $25 billion in EBITDA this year," Ellinghorst wrote in an email. "If you assume some synergies and peak U.S. cycle market conditions then, yes, they could get to 30 billion in EBITDA." On background, a GM official said company executives have not seen Marchionne's analysis of what a combined company would look like. But he expressed doubts about how Marchionne could hit his profit projection while keeping a promise made to dealers last week in Las Vegas not to impact retailers or cut manufacturing jobs. Asked directly, a GM spokesman wouldn't call Marchionne's analysis wrong but said GM officials believe the company and its shareholders are better off on their own. Marchionne said he has never met GM CEO Mary Barra. "I'm not trying to date Mary, for the record, but I tried to get to see her." A GM spokesman said: "We've responded appropriately to any outreaches that he's had." And if there is resistance to sitting down with FCA because of Marchionne's reputation as a crafty and cagey deal-maker, Marchionne has an answer for that, too. "Look, I'm a tough negotiator and people know it, right? I am who I am, but so what?" he said. "Send somebody else in. Send the shark. I'd come off the table." Marchionne insists there is too much to be gained. He said he is "not the guy at the corner who's selling pencils. I tell you that you can make X billion more by being together, I guarantee you that I can carry half the market." In a note to investors in June, Max Warburton, an analyst at Sanford C. Bernstein, wrote: "Putting together FCA and GM looks like an operational and management nightmare -- but frankly if anyone can smash through the issues and make it function, it would be Marchionne." The FCA chief himself said: "An attack on GM, properly structured, properly financed, it cannot be refused. You can play hardball to a point. ... It's too big to ignore, which is the issue that our board is facing." Barra, who publicly swept aside Marchionne's advance, said in June, "We have scale," and she said GM is busy "merging with ourselves." Marchionne admits joining with GM would be a hard slog, but he stands by his claims. "When you get to these type of analyses and this type of very thorough introspection about your business and the other guys' ... you walk away with a conviction that barring implosions ... driven by cultural differences that it's worth taking the risk. The benefits are so high that I don't think you can stop the machine. "This is not a question of telling me to screw off. I understand [GM's] desire to be alone and execute [its] plan. I've listened to the comments ... 'we're still merging with ourselves,' which I do not buy for a company that is 107 years old. You can't merge with yourself." Luca Ciferri contributed to this report. COMING NEXT WEEK: Four ways the auto business can pursue the benefits of consolidation, without full mergers. What is the promise of each? What are the pitfalls? What do they need to succeed?